People affected byhomelessness are invited to attend SHAPING LIVES 2018: LINKS TO HOMELESSNESSSERVICES, in Centennial Hall, at the Newark Public Library, 5 WashingtonStreet, on Wednesday, October 10, 2018, 10am-2pm. Over 25 providers of health, nutrition, shelter, and other services will be present. 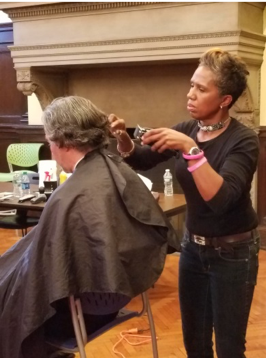 In addition, participants will be offered free haircuts, manicures, clothing, toiletries, snacks, and other useful items and services. Audible will provide free lunches. The Newark PublicLibrary is New Jersey’s largest municipal library, providing collections and services at the Main Library and seven branch libraries located in neighborhoods throughout the city. The Library serves as a gateway to knowledge and lifelong learning for diverse audiences. The Newark Public Library has partnered with the Rutgers University School of Social Work to engage a student social worker to assist visitors with counseling and referrals to social welfare agencies and organizations. For more information, please contact Leslie Kahn at The Newark Public Library:973-733-7779 or lkahn@npl.org.